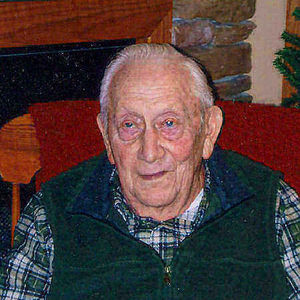 Donald A. Schmitt, 92, Breckenridge, MN and formerly of Wahpeton, ND died on Tuesday October 30, 2012 at the St. Francis Healthcare Campus-Hospital in Breckenridge. The Mass of Christian Burial will be held at St. John's Catholic Church, Wahpeton on Friday, November 2 at 10:30 A.M. with Rev. Dale F. Lagodinski officiating. Visitation will be held on Thursday at the Vertin-Munson Funeral Home, Wahpeton, from 5 PM to 7 PM, with a 7 PM Knights of Columbus Rosary. There will also be visitation one hour prior to the funeral service on Friday morning. Interment will be held at Calvary Cemetery, Wahpeton, with military honors by Wahpeton Military Unit. Donald A. Schmitt was born on September 3, 1920 in Summit Township of North Dakota to Joseph and Lettie (Chezik) Schmitt. He attended grade school in Wahpeton and graduated from Wahpeton High School in 1939. On March 9, 1943 he entered the United States Army serving in the 8th Armored Division during WWII. He was honorably discharged on February 9, 1946 He then attended the North Dakota State College of Science and graduated with a degree in Small Engine Repair. Don worked at Ray Moss Electric from 1948-1966, Nielsen Electric from 1966-1974 and D and E Machinery from 1974-1982 all of Wahpeton, when he retired. Donald resided with his sister "Kate" for many years; Kate passed away October 31, 1992. Don continued to reside at his home in Wahpeton, later moving in the Twin Town Villa, Breckenridge, MN until entering the St. Francis Healthcare Campus in 2007. Donald was a lifetime member of St. John's Catholic Church, Knights of Columbus, Hafner-Miller-Ross American Legion Post No. 20 and the Woody Keeble VFW Post No. 4324. Donald enjoyed visiting with others and was a good story teller. He loved to watch his relative Matt Samuelson play sports for the Breckenridge Cowboys, becoming an avid fan. He is survived by his cousins, John and Rosemary Samuelson, their children, Monte (Dawn) Samuelson, Millard (Ann) Samuelson, and their children, Jeanette, Phillip, Matthew and Katie and several other cousins. He was preceded in death by his parents, Joseph and Lettie Schmitt and his sister, Kathleen Schmitt. My sympathies to all in the loss of Donald.May he rest in peace.Esther Kraus.